This week on The Great British Bake Off was dessert week and it was undoubtedly an episode that left every viewer craving cake! The show started as always with the signature bake which was to create their take on the classic roulade. Some of the flavour combination sounded out of this world and it inspired me to try to make my own free-from roulade. 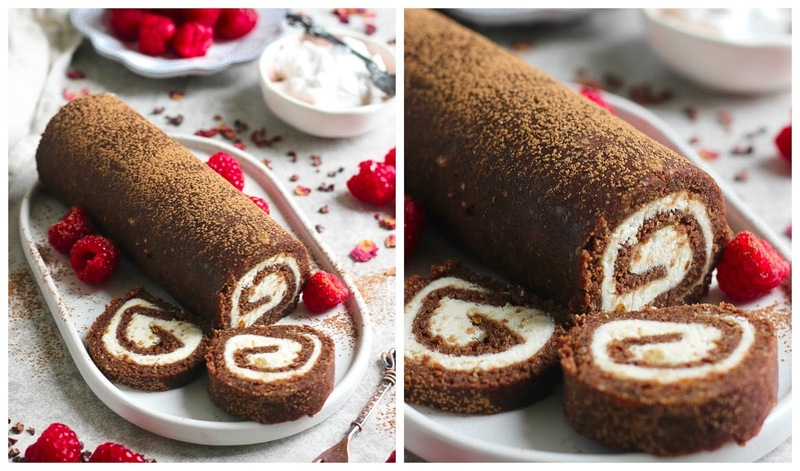 I was a little worried I wouldn't be able to do it but with much planning I succeeded in making this mouth-wateringly delicious Chocolate & Vanilla Roulade complete with sweet sponge and creamy vanilla filling. This roulade recipe is actually un-baked which makes it pretty darn easy to throw together and means there's no risk of burning it in the oven! It may be unbaked but the sponge is just the best texture and the flavours are unbeatable. The whole recipe is free from gluten, dairy eggs, soya and refined sugar so it's suitable for so many. I actually made this for my sisters 21st birthday for the whole family to enjoy and everyone came back for seconds! It's the perfect decedent weekend sweet treat, it's ideal for celebrations and it looks pretty awesome too. I can't wait to see your recreations! Be sure to check in next week to see what I recreate from The Great British Bake Off WEEK 5! A rich, sweet & delicious raw chocolate sponge roulade with vanilla cream. Gluten free & Vegan! Start by making the sponge. To do this add the oats to a food processor and blend until a flour forms. Then add the ground almonds and cacao powder - blend again to fully combine together. Pit the dates and add them to the food processor as well as the maple syrup, vanilla, water and pinch of salt. Blend until a thick, sticky mixture forms. Lay out a piece of clingfilm on your kitchen surface and place the chocolate sponge mixture in the centre of it. Cover with another sheet of clingfilm and roll into a rectangular shape. Remove the clingfilm and neaten up the edges of the rectangle. Now it's time to make the cream! Drain and rinse your soaked cashews and add them to a food processor along with all the other vanilla cream ingredients. Blend until smooth and creamy. Spread the vanilla cream over the rolled out sponge evenly. Slowly roll the roulade up tightly, using the clingfilm that's underneath the roulade to help with this. Carefully place the roulade into the freezer. Allow to chill where it'll set for at least 45 minutes. Remove from the freezer 10 minutes before cutting and serving!